Is there a space exploration race among BRICS nations? On Sunday, India became only the fourth country in history to employ scramjet engines in the launch and propulsion of space rockets. Scramjet technology relies on hydrogen as fuel while oxygen from the air is used as an oxidizer to burn the fuel. Combustion occurs externally while the craft is moving at supersonic speeds. While the US has already used scramjet engines, China and Russia are also developing the technology. India’s successful scramjet test came just four days after the China National Space Administration published images of its space probe and rover which will be part of its upcoming mission to Mars. China is also planning launch a “core module” for its first space station some time around 2018, part of a plan to have a permanent manned space station in service around 2022. In recent years, China has rapidly increased its focus on its space program. Two weeks ago, it launched a quantum-enabled communications satellite. The 600+ kilogram Quantum Experiments at Space Scale, or QUESS, satellite, will circle the Earth once every 90 minutes after it enters a sun-synchronous orbit at an altitude of 500 kilometers. “In its two-year mission, QUESS is designed to establish ‘hack-proof’ quantum communications by transmitting uncrackable keys from space to the ground,” the Administration said. 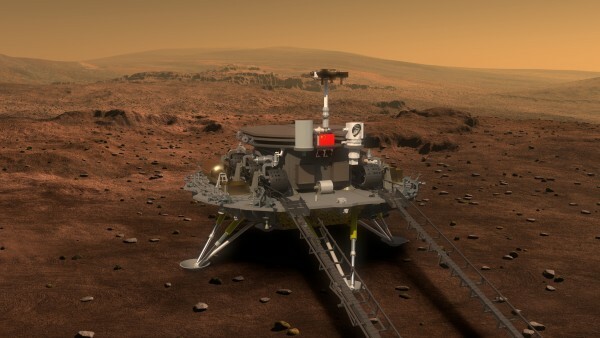 China’s current space program kicked into high gear with the launch of its first moon mission and rover in December 2013. Although that mission ended earlier this August, after 31 months, it did spur a new round of lunar exploration that will culminate in another probe to be sent to the far (dark) side of the moon in 2018. China sent its first astronaut into space in 2003, becoming the third country after Russia and the United States to achieve independent manned space travel. China’s rapid space program development comes on the heels of earlier successes by BRICS fellow member India. Between 2017 and 2020, India will launch the Aditya mission to study the solar corona. This part of the Sun has temperatures of over 1 million degrees, with raging solar winds that reach a velocity of up to 1,000 km a second. In January, India successfully launched its fifth navigation satellite, joining four previous ones aimed at forming its independent navigation system. New Delhi is aiming to expand the country’s influence in the competitive $300 billion global space industry. The IRNSS-1E is the fifth navigation satellite in the IRNSS space system, comprising seven satellites, which would be an Indian version of the American Global Positioning System (GPS). The launch of the satellites comes in the wake of India’s very successful Mars mission of its own. Its $73 million Mars Orbiter (MangalYaan), which was launched in November 2013 to explore the red planet’s surface features, morphology, mineralogy and search for methane in the Martian atmosphere using indigenous scientific instruments, entered its orbit in September 2014. The mission was nothing short of historic. India became the first country to succeed on its first Mars mission and also the first in Asia to reach Mars. It’s MangalYaan Orbiter mission cost 1/9th the budget NASA spent for its own Mars mission. NASA plans another Mars mission in 2020. Both China and India have dedicated billions of dollars to their space programs, but their budgets are still far below the US budget estimated at $40 billion. With their ambitious space exploration and Mars missions, China and India have become members of a select club of space-faring nations along with US, Russia, France and Japan. Top administrative officials in Beijing said Chinese space scientists are “looking forward to cooperation with other countries, including the country’s close neighbor India”. 2 Responses to A BRICS space race?